Although tooth enamel is the hardest substance in the human body, it is not invincible. Tooth enamel can be damaged by injury or trauma to the mouth, biting down on a hard piece of candy or ice, or can be weakened by decay and crack. When the crown of a tooth receives too much pressure (especially if it is weakened) it can crack – a common issue that affects millions of Americans each year. At Lawrenceville Family Dental Care, we offer cracked tooth repair as part of our general dentistry treatments. It is essential that you have your cracked tooth repaired as soon as possible so that cavities and decay do not enter into the inner structure of the tooth. Severe pain is often associated with a cracked tooth, so having it repaired as soon as possible is beneficial to your comfort level. Dr. Patel provides specialized repair for a cracked tooth. Early diagnosis is easily identified through regular dental exams, allowing for early intervention to be successful at restoring your tooth to full strength and health. At Lawrenceville Family Dental Care, we will provide a gentle and effective repair for your cracked tooth. Dr. Ashish Patel is a qualified and experienced dentist that understands the importance of early intervention to damaged teeth. Cavities, cracks in the tooth enamel, and any sort of damage to the tooth itself can leave the tooth vulnerable to infection and loss, and can even leave neighboring teeth susceptible to the same fate. 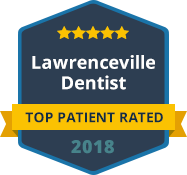 Dr. Patel and the staff at Lawrenceville Family Dental Care have the tools and knowledge to repair damaged teeth in our office. Simple cracks may simply require the tooth to be repaired with filling material, while more complex dental damage may require a root canal procedure. Whatever treatment you need will be done to keep the damage from spreading and relieving your pain. Contact Lawrenceville Family Dental Care as soon as you feel that you may have cracked or damaged your teeth. Our gentle and comprehensive dental care approach ensures that you will receive the effective treatment that you need.